5 Questions with Eric Enge, President of Stone Temple Consulting and SEO Expert - Wood Street, Inc.
SEO (search engine optimization) is one of those disciplines with lots of “experts” who all have lots of opinions on what works and what doesn’t. It’s taken some time for me to determine who is consistently right and who is just another snake oil salesman. Eric Enge is the CEO of Stone Temple Consulting, an SEO firm. He is also co-author of The Art of SEO along with Rand Fishkin, Stephan Spencer, and Jessie Stricchiola. – bio courtesy of Moz.com. Let’s get to this, shall we! The hardest part for people to get in the world of SEO is that Google can articulate what they want publishers to do via their Webmaster Guidelines, but their ability to enforce those guidelines is very uneven. This constantly leads to situations where clients are pointing at sites saying “look at what they are doing, and they are ranking well, we should do the same thing”. Sometimes, that logic is as solid as it sounds, but the problem is that there are so many times where this happens and the client is pointing at a site that is following bad SEO practices, but it’s working for them because Google has not figured out that they are doing bad things yet. This happens ALL the time. Sadly, if the client does go ahead and copy that competitor the results are often not good. Just because someone else is getting away with violating SEO best practices does not mean it will work for you. That’s a hard reality, but you just need to move past it, and hope that the day when Google catches up with that misbehaving competitor comes soon! Once they do, if you have been working at doing things the right way, you will reap the reward of your patience at that time. Question Two – Should Everyone Know about SEO? In creating websites for our clients, SEO comes up a lot. Some folks still do not know what this means. Do you find this surprising? Do you think people need to have a basic understanding of SEO, or does that really matter? Understanding what the content on your web site is about, so it can understand what user search queries may be relevant to your site. Understanding why your site is important enough to rank highly for such queries. These both require some investment to do properly! Your book, The Art of SEO, was one of the most comprehensive and useful on the subject I’ve read. You co-wrote this with 3 others (Fishkin, Spencer, Stricchiloa). You’re now on your 3rd edition! Do the four of you have TAOS summits to discuss what’s new? Are you ever amazed at what’s changed since the last edition? Actually, we simply get together once we realize that enough changes have happened in the industry that we begin to feel like it needs an update. As it turns out, the 3rd edition is about to go into tech review. Note that Rand will not be on this edition, as he has just become too busy to participate, but the other 3 of us are carrying it forward. In the 2nd edition, Chapter 7 was called “Link Building.” But, we renamed it “Content Marketing” in the new book, just to emphasize the need to focus on a more holistic approach to things. The 2nd edition version of Chapter 7 was quite holistic as well. It was just time to integrate a lot more info on how to integrate with PR and marketing efforts. In the 2nd edition, Chapter 8 talked about how social media was a ranking factor. In fact, for a brief window of time the search engines experimented with that. However, they backed away from it and abandoned it for a variety of reasons. For that reason, we had to rewrite that chapter entirely. We added a chapter that was not present in the 2nd edition, on Panda, Penguin, and Penalties. These are such a large part of the landscape, we think they were critical changes. The Internet of Things… it’s everywhere! Content will soon be accessible on everything from your watch to your fridge to your shoe. How does SEO fit into all of this and what do marketers need to start preparing for? It’s important to think about SEO in a very flexible way. New devices and new capabilities create new opportunities, and new challenges, for marketers and businesses. Someone will always be required to figure out how to take advantage of those opportunities. It’s hard to determine the specific actions required as these new technologies become available, but there will always be something. Google+ seems to die every day. It’s almost as hardy as Keith Richards. What do you think the future holds for Google’s “social” platform? Google+ is driving personalization of search results for hundreds of millions of people. This results in higher click through rates on ads in search results, and this brings revenue to Google. Lots of it. Social media is not an option for Google. They are not going to back away from it. They are continuing to invest in it. Dave Besbris confirmed this in his interview with recode.net. Sure they want a bigger audience for Google+ than they have, but the hundreds of millions of users they already have is arguably the 2nd largest social network out there. 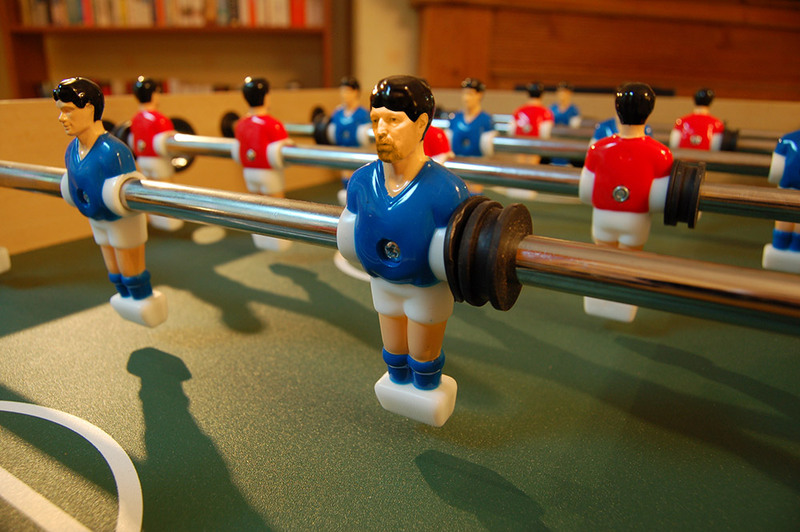 Bonus – The 1984 World Foosball Champion, OK?!? You won the coveted 1984 World Foosball Championship. Congrats! I assume you played a lot of Foosball in college. So, my question is this… how did you manage to be valedictorian at Northeastern playing that much foosball??? Ha! It’s all a matter of priorities. ;-> Seriously, it was one of my more significant social activities. As it turns out, I won the championship after I graduated, and had more time to travel around to tournaments. Lesser known is the fact that I also won the US National Championship in 1985. It was fun to do at the time! I don’t really play any more, but I do have the latest tournament table at my house. It makes for great demo material at parties.